What is kimchi? It is a very spicy, pickled/fermented cabbage, typically prepared with a variety of seasonings including garlic, red or other chili peppers, and vinegar. But, what is kimchi? It is a staple food of Korea; so common, and so popular a side dish (average annual consumption of over 40 pounds per person), it is present on the home and restaurant table, morning, noon and night. Still, what is kimchi? It is a key intermediary between people meeting together at table; it is the maker and maintainer of friends in friendship. It is even invoked to bring a smile to faces when taking pictures, replacing “cheese” as the word of choice. Kimchi was a motivating experience of the recent Pacifica trip to South Korea for us travelers, who participated in interfaith dialogue and roundtable discussions on Countering Extremism at the Grassroots Level, held in Seoul and at the Seoul National University’s Graduate School of International Studies during the early days of April 2016. 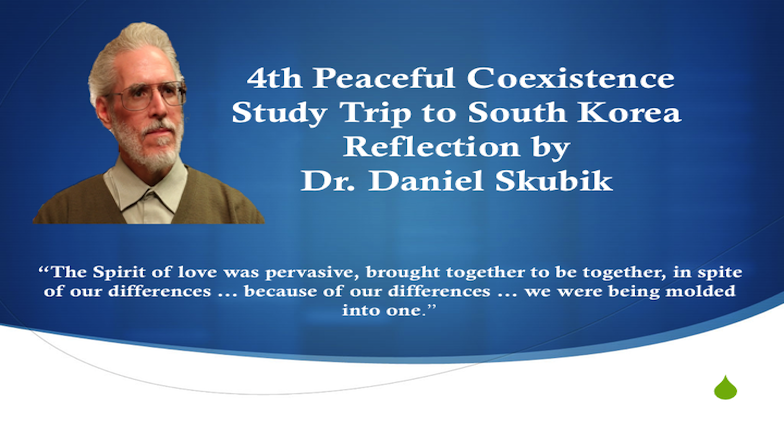 Co-hosted by the Korean Council of Religions for Peace (KCRP) and the Hangang Network both organizations based in Seoul, participants included religious leaders and academics from South Korea, Turkey, and the United States. Discussions focused on how to respond to the attractions of extremism targeting youth. The bond of these discussions was food … and faith; a commitment to eating together and sharing religious perspectives and concerns for the sake of building friendships which might endure. Many ideas were generated, ranging from youth summer camps to interfaith education programs, from gang intervention programs to spiritual mentoring. In addition to these specific engagements, the trip’s agenda included visits to and interfaith dialogue with a wide variety of religious institutions/places of worship and representatives from across Korea, including Buddhism, Confucianism, Protestant, Catholic and Orthodox Christianity, and Islam: all were and are welcome. What a rich variety of faiths … what a diverse body of believers … what a singular commitment shared by all to understanding and peace. The Spirit of love was pervasive, brought together to be together, in spite of our differences … because of our differences … we were being molded into one.